Good news! Creative will be at IT SHOW 2012, Level 6, Hall 602 at booth 6238. Though there are no new products from Creative to showcase during this exhibition but we are just glad that they took part in one of the hottest IT exhibition in Singapore! Just got confirmation from one of our readers that he will be supplying some exciting photos from the Creative Booth @ IT Show 2012. Stay tuned! 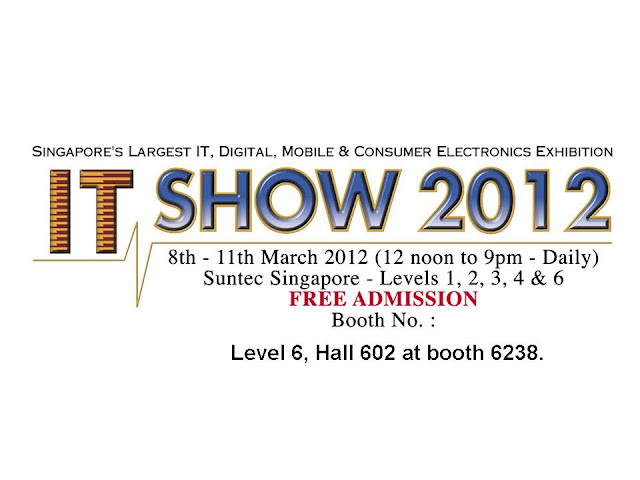 In meantime, enjoy all these promotional prices when you buy a Creative product from IT Show 2012! i expect a fiber broadband war igniting in this IT show as new players like MyRepublic come in and also due to fiber coverage to most parts of Singapore by June 2012. Qmax should also join in as Wimax is going to be a failed venture. The world eventually will be moving to fiber and LTE due to higher demand for HD 3D video contents and so on. another divestment profit? thx sold for profit recently. Hmmm....Another failed unit in Creative. I still remember getting a free web camera for joining Qmax in wireless@sg. Now it's just history. Wireless@sg which is free for public access is getting slower and too congested. It has limited coverage areas too. Sometimes i find it's a bother to get connection. Hence I rather use my 3G connection. pointless talking about the past.